AMS Swindon New Premises Launch Swindon Music Courses. On 30th January, AMS Swindon held the official opening event for their new centre. Situated at 1 Milton Road in the town centre, Swindon Music Courses are now easy to access. Musicians guests make a smashing opening. As well as official Mayoral Endorsement, local singer/songwriter legend Nick Harper attended the event to play a guest acoustic set. 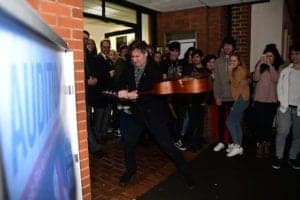 Harper christened the building by smashing a guitar on the entrance in true rock star fashion. Following the opening ceremony, guest were able to tour the building at their leisure and enjoy live performances from the students in the brand new space. All in all, it was a fantastic evening for the academy of music and sound and the Swindon music scene. If you’re interested in touring the new centre, please contact swindon@academyofmusic.ac.uk or call us on 01793 644477.